When Did the Byzantine Empire Fall? This article details the fall of the Byzantine Empire. 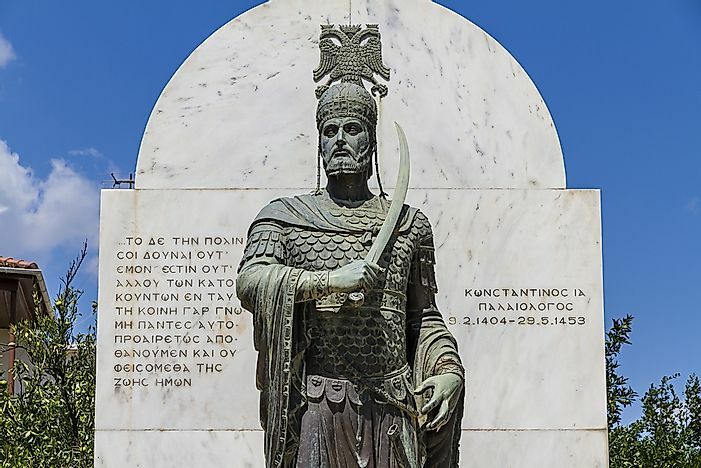 Statue of the last Byzantine emperor. The rise of the Byzantine Empire occurred simultaneously with the fall of the Roman Empire. The power and influence of the Roman Empire began in the 3rd century CE, in a period that saw the empire plagued with civil wars caused by the collapse of administrative structures. Constantine I ascended to power in the early 4th century and later in 330 CE, established Constantinople as his seat of power. Constantinople was founded on the site of an existing city known as Byzantium, from which the empire got its name. Constantine’s successors continued expanding the empire, ultimately leading to the Byzantine Empire to cover most of the Mediterranean region encompassing Egypt, Sicily, Italy, Greece, and Rome. The empire was combating numerous challenges throughout its history, some of which ultimately led to its demise. During the Late antiquity period, the Byzantine Empire faced invasions from the Atilla the Hun, the Visigoths, the Vandals, and the Alans from numerous fronts. The 5th century was marked by the rise of Islam in the Mediterranean, with the Arabs engaging in war with the Byzantine Empire, which led to the fall of Egypt and the Levant between 634 CE and 641 CE. The Battle of Yarmouk in 636 CE between the Byzantine Empire and the Rashidun Caliphate saw the empire experience another humiliating defeat. After the victory, the Arabs revved up their campaigns against the empire and succeeded to conquer Asia Minor, Sicily, Crete, and Cyprus. The fall of Egypt was a major blow to the Byzantine Empire, as the region was an important source of grain and manufactured goods. In the 11th century, the Byzantine Empire saw the rise of another challenge in the form of the Seljuq Empire, with the two empires clashing in the Battle of Manzikert in August 1071, which resulted in the decisive defeat of the Byzantine Empire. The humiliating defeat was compounded with Byzantine’s loss of Armenia and Anatolia to the Seljuq Empire. The century also saw the invasion of the Normans who had captured vast territories in Italy by the 12th century. Another threat faced by the Byzantine Empire was the Plague of Justinian, which decimated the population of the empire between 541 CE and 542 CE. During its peak, the plague led to the death of 5,000 people each day in Constantinople. The Crusades, which were initially meant to assist the Constantinople-based Empire to reclaim its lost territories, ultimately became a threat to the Byzantine Empire. The Fourth Crusade of 1204 CE, in particular, was incredibly devastating to the Byzantine Empire, where soldiers in the crusade mutinied and invaded Constantinople where they engaged in widespread looting, vandalism, and destruction. The event, which came to be known as the Sack of Constantinople, weakened the Byzantine Empire’s military and economic influence, which led to the invasion of the Ottoman Turks in the 13th and 14th centuries. The Ottoman Empire was ultimately victorious in the Byzantine-Ottoman wars, which culminated in the fall of Constantinople in 1453. Why Did the Ottoman Empire Fall? When Did the Roman Empire Fall? When Did the Inca Empire Fall? What Does The Sun Never Sets On The British Empire Mean?